In the fall of 2010 I deployed for an 8 month deployment on the USS Abraham Lincoln. I moved my husband Pedro and son Lucky to Texas as we are from the Garland/Mesquite area and to be near family. It was the hardest thing I have ever done to deploy on a US Navy carrier and hope and pray my husband could handle a 2 year old little boy and being a single parent for 8 months. So what a relief when he emailed me to tell me he had found a Montessori school that would agree to let my son enroll for 3 days a week on our limited budget. My husband said that your wife was so kind when she interviewed him and he knew very quickly that this was the place our son would grow. He recalled the first day he went to school to inquire about tuition and said you were a gentle soul with much love and patience with the children. He sent me many more emails about how much Lucky grew in the time he was enrolled at your school. Improvement was seen in all areas including vocabulary and social skills. The kindness, love, and attention that you paid to my son can never be replace and I truly believe he has excelled tremendously from the short time he experienced your wonderful curriculum and expert staff. My son briefly went to a Navy childcare after I returned from deployment in Washington and they were amazed at how much he knew from his numbers, letters, shapes, and colors. And we contribute his success to you, your wife, and exceptional staff. Last week Lucky started pre-school on his 4th birthday and I have the utmost confidence that he is advanced and will do well in school because of the groundwork you have already established and set for him. A year later after he left your school in March 2011 he is just as loving, eager to learn, and a happy boy. Thank you for doing what you do. Thank you for taking care of my son. Thank you for giving me peace during a trying time. Thank you for loving my son as much as I do. Thank you for having an outstanding passion to love, educate, and seek excellence for your kids. You impacted our lives, my son Lucky's life, and I am forever grateful. "Lake Cities Montessori is a first class educational facility. The quality of care and nurturing provided by the staff is exceptional. There is a genuine feeling of love and compassion that manifests in the smiles and laughs from all the children who attend this school. The facility is clean and neat and the outdoor play equipment is maintained well. Best of all, the staff is extremely courteous and professional. The staff is truly the heart of the school and they are wonderful. Truly a diamond in the rough if you are tired of searching for great childcare. Dr. Adibi and his wife Ms. Mary are some of the most caring and wonderful people I have ever encountered, childcare or not. Their dedication and enthusiasm permeates the school and its staff. The quality of their carefully cultivated learning environment and educational curriculum has done wonders for my sonâ€™s development. The exponential leap forward in his verbal and social skills has been miraculous to watch. In only a short amount of time, he has gone from anxiety about his new school, to not wanting to leave at all. He also refuses to leave before getting hugs from Dr. Adibi and Ms. Mary. I cannot recommend this facility more highly. As a military family, we have seen many educational systems and centers, but this school and the Montessori System is truly elite. Dr. Adibi was generous and gracious in accommodating the special needs and circumstances of our military family, and for that, he has our heartfelt thanks. It is only because of military commitments that we are forced to leave this wonderful environment. I wish we could take it with us." 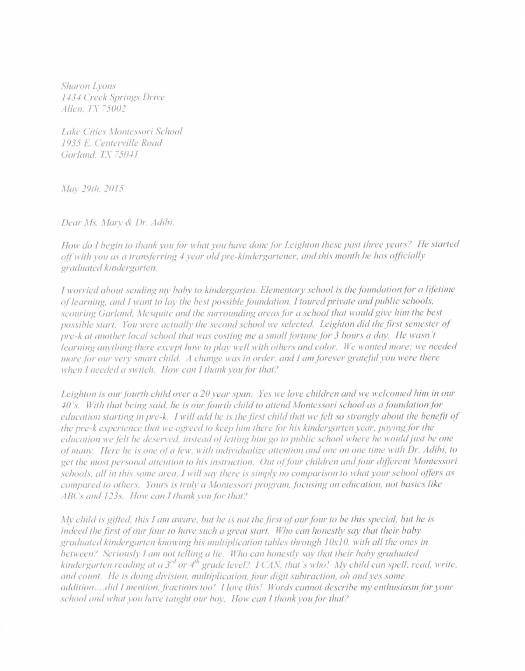 "Lake Cities Montessori School has been a tremendous help for Nicole. She has grown quite a bit while attending the school. She is presently attending on a part time basis, but I look forward to her attending full-time in the near future. She has learned how to work as a team and practice patience, which was a problem for her initially. The staff has been so patient with her, and I'm really thanking GOD for them. She really enjoys her classmates and always looks forward to the next day. The staff at Lake Cities Montessori is so caring. I would really like to take note on Dr. Adibi and Mrs. Mary. They have really been tremendous with their concern and effort. Thanks for your support. " "More than Excellent school, my kids love their school, i have 2 children attending this school a 2 year old and a 4 year old, I am so happy about the care, love and quality of education they receive. The teachers are excellent they are so loving and dedicated. Mrs Mary is an angel and one of the best teachers a child could have, Dr. Adibi the director is professional and respectable teacher. My family and I consider ourselves lucky to have found this school where the care, hours, food, fun activities, education and prices are all Exceptional!! i highly recommend Lake Cities Montessori." "By far the best school my children have been enrolled in. Dr. Adibi and Ms. Mary are completely dedicated to providing a great educational experience, and this reflects in the curriculum, the staff and the children. I had a kindergartener and a preschooler attending, and they always impressed me with how much they were retaining in all subjects. The school put on performances and family nights for everyone to take part in. The conferences are very thorough so you are always informed about your child's progress. I was especially impressed with how the children were encouraged to resolve their conflicts. Issues between kids were not ignored or glossed over, but the children were taught to talk things through."